Ah, color! 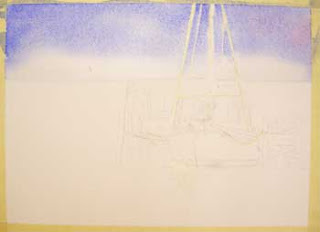 I have wet the sky area with clear water, then applied a generous amount of French Ultramarine Blue. By tipping the board I can use gravity, instead of my brush, to make the pigment flow. The lack of brushing keeps the wash nice and smooth as the paper is not disturbed with all of the bristles on my brush. I have kept the tree line white with the softened edge created by water. The board has been tipped in all directions, but mostly I have tipped it toward the top of the sky so the darkest pigment flows in that direction. When I am satisfied with the value (it should be dark if I want it to look like a sunny day! ), I added just a touch of wet Permanent Alizarin Crimson in one corner just to add a little warmth. I like to make the corners of my paintings each a little bit different. This also gives the piece a little depth and variety. Allow this to dry thoroughly. You can use a dryer but don’t hold it too close to the masking, or use a cool setting.